I should be sound asleep resting up for a big day tomorrow, but I couldn't resist. I saw an announcement hit Twitter that I have been waiting on for a long while. Google's AppEngine team has announced support for Java and has also released an Eclipse plugin that makes development much easier. They are letting the first 10,000 interested in Java into give it a test run, so go over and get signed up. If you are running Ganymeade then you can grab the Google AppEngine plugin from the update site at http://dl.google.com/eclipse/plugin/3.4. It was extremely simple to go through the happy path after installation and get my first GWT application up and deployed. In fact, Google provided all of the code. Nothing better than a full example to get you going. After installing the plugin, you will see that there are three new buttons that have been added to the toolbar. They are for creating a new web application, compiling and deploying to AppEngine. 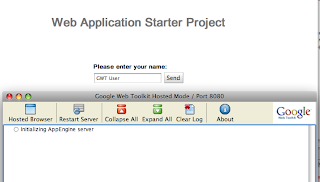 All that you need to do is click on the first button, name your application and give it a package. 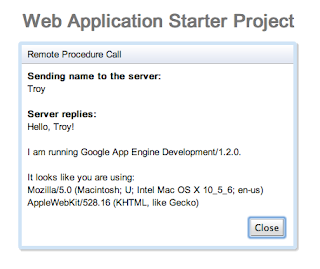 After that, simply right click on the project and choose Run As > Web Application. This will activate your local AppEngine installation and show the application which simply asks your name and gives a confirmation.